Back in October, 2012 I was looking for a new bicycle. I was rowing quite a bit at the time (3 times a week) and my club was about 9km from home. I wanted to ride to practice, but the bike I owned was not doing the trick. It was a heavy Rocky Mountain hardtail mountain bike that weighed in at about 30 lbs. I would get to the rowing club tired, exhaust myself for 2 hours at practice, and then have to figure out how to ride home. It wasn’t sustainable. So I started looking into a road bike. Originally I wanted to stick with Rocky Mountain and took a look at their line-up, but a couple of friends (one a former bike racer and the other married to one) steered me in a different direction. They gave me a list of brands to look for, and stores to check out. Of course they were spending someone else’s money, so sent me towards the high-end stuff. I have a penchant for nice things (I see nothing wrong with that), and justified to myself a thousand different ways how it would make sense to ante up for a nicer bike, even though I had never ridden a road bike before. Carbon? No idea why it was better, but I was told it was better, and it sounded cool. Besides, carbon is lighter right? Sure, why not. Cervelo? I had a friend who recommended the brand after he fell in love with cycling and bought one. Another friend had it on her list of brands to try out. I knew the company was (at one time) Canadian and that some pro team with a BC-born rider uses them. Also cool. Besides, as some would help me understand, if I really got into cycling, I’d want to upgrade so why not just do it up the first time? Sure, twist my rubber arm. 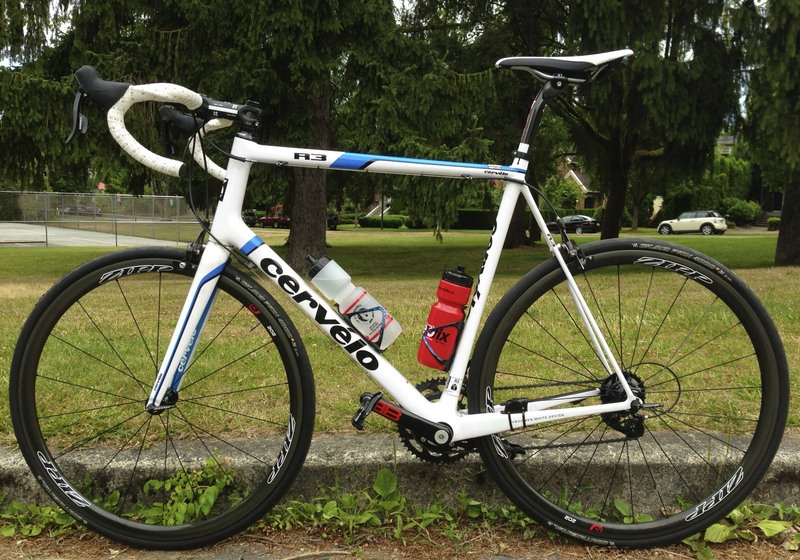 Low and behold, I found myself getting fitted for a 2012 Cervelo R3 on year-end clearance. Why not jump into the deep end of the pool? Sometimes I can’t believe that I bought such a fantastic bike on the premise that I would use it to ride to rowing practice, and it’s poetic that I have dug into riding so seriously as a result. Ironically it would only be a few months later that injury would force me to retire from rowing, thus rendering my ‘riding to practice’ ethos null and void. It’s been a match made in heaven, me and my R3. My white stallion has been an instrument of great satisfaction throughout my journey. No excuses, I’ve said; my bike will not be the reason I can’t do a ride, make it up a hill, or overcome a challenge. It’s on me. And the joy of riding such a bike is indescribable. I feel safe. I feel capable. I feel empowered. It’s very likely that I might not have pursued cycling much further without such an investment. great story! I work for Cervélo and will share this entry with my colleagues for sure.